Colorado Parks and Wildlife is seeking volunteers to serve on a statewide advisory panel. 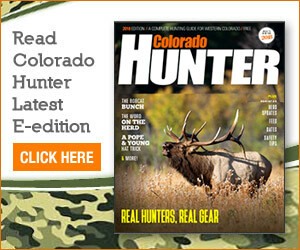 The Colorado Sportsmen’s Roundtable meets twice per year to discuss and provide feedback to Parks and Wildlife officials on hunting, fishing, and wildlife management issues, the agency reported in a news release. Individuals interested in serving on the sportsmen’s roundtable may fill out an applicationapplication online. The application deadline is Feb. 15. online. The application deadline is Feb. 15.
application online. The application deadline is Feb. 15. Sixteen individuals will be chosen to serve one or two-year terms. For more information, contact Dave Chadwick at dave.chadwick@state.co.us or 303-291-7174.